In December 1964 there was, apparently, a meeting of gospel groups in London with Dave Payne (in West Ealing) to share the experiences of some gospel groups and to talk over problems. This was to be the start of MGO (Musical Gospel Outreach) which was set up initially to "deal with basic group problems". 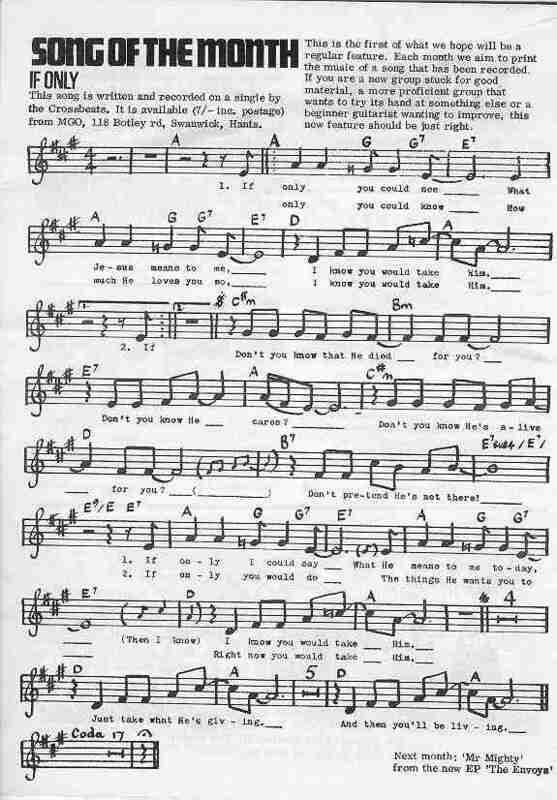 The first BUZZ magazine was to come about a year later (October 1965), and consisted of 8 sides of A5 paper. Some of the other people involved with MGO/Buzz were: Pete Meadows, Geoff Shearn and John Webb. Along with advice for new Christian bands, BUZZ would publish snippets about groups each month. For example, BUZZ was on the list of prayer partners of the crossBeaTs in order, probably, to receive such information. The following images give a flavour of the early BUZZ Magazines. It's probably fair to say that we (the crossBeaTs) didn't have too much to do with the MGO scene. We had good fellowship with the people there on occasions, but we weren't really 'into' the same things that they seemed to be 'into'. They were very much into 'helping other groups', a kind of 'meta-ministry', and although I think we did our fair share of this locally, we didn't really enjoy talking about 'how to do it' - how to be a gospel group, how to overcome little problems etc. We just wanted to get on with it. We may have been like this out of a sense of insecurity, or it may have been out of a kind of (false?) humility - we certainly felt it would be arrogant of us to pontificate and tell others 'how to be a gospel group'. For example, MGO organised weekends away and workshops (like the one on 12 December 1969 - see booking list), which is exactly the kind of thing we would have steered clear of. It may simply be that some people are the talkers (the organisers, the managers of people) and some people are the doers. We were certainly the latter. It has to be said that MGO did stalwart work, through BUZZ and through the things they organised, in affirming and helping other groups to 'hang on in there'. 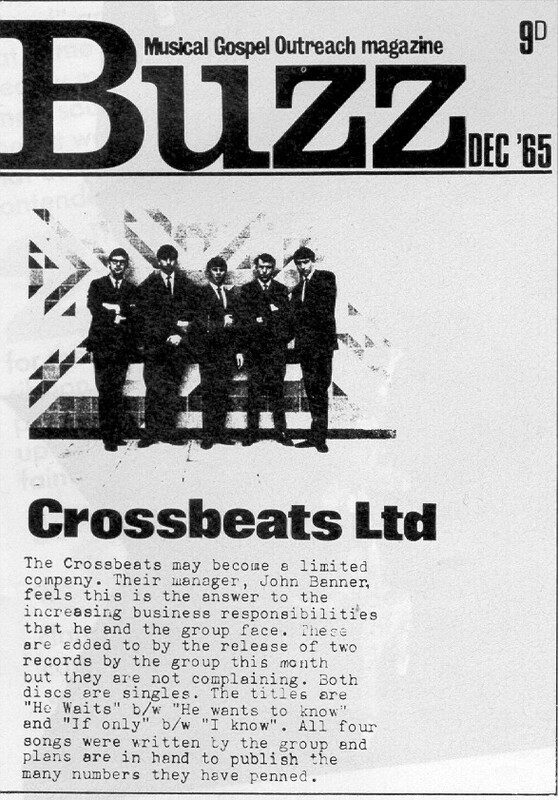 The BUZZ pages here and below only show examples of the crossBeaTs. 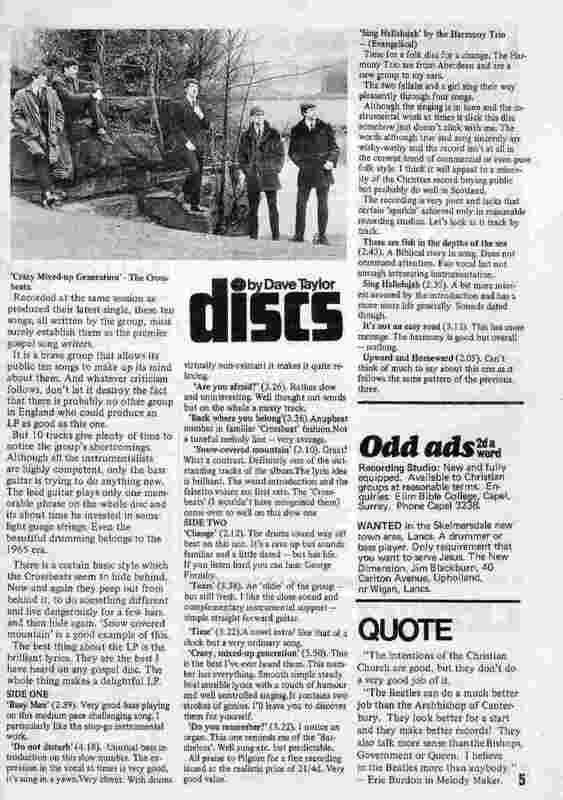 Those interested in the rest of the early UK CCM scene would find that the other copies of BUZZ would contain much useful information. In 1987, "Buzz" magazine changed its name to "21st Century Christian". 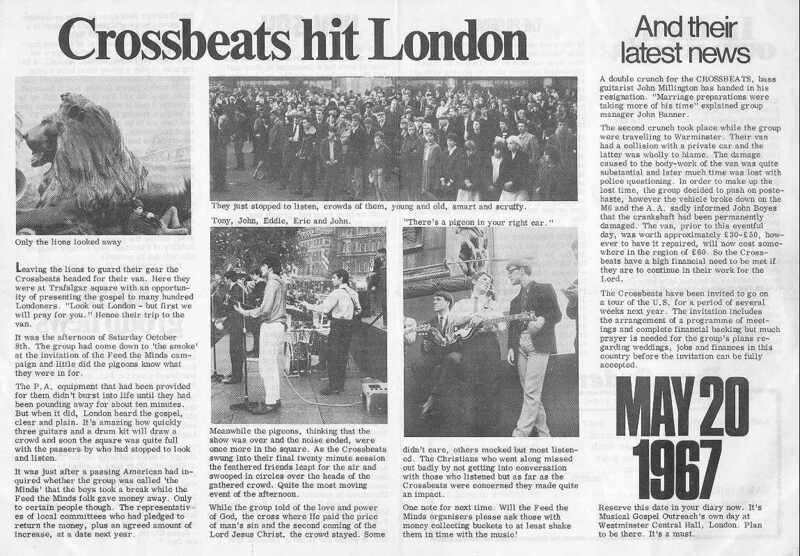 Some time later it merged with "Today" (a magazine which had previously been called "Crusade") - and they together were called "Alpha". With subsequent changes of ownership, the magazine "Alpha" then became "Christianity" and finally (finally?) "Christianity + Renewal". Confusing, isn't it? In many ways, however, the place of Buzz has been taken by the magazine Cross Rhythms, which in 2002 is probably (as Buzz was in the old days) the definitive UK magazine for CCM.